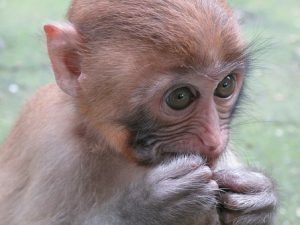 Beijing’s National Science Review journal, researchers took human copies of the MCPH1 gene, which is believed to play an important role in our brain development, and introduced it into monkey embryos by means of a virus that carried the gene. “This was the first attempt to understand the evolution of human cognition using a transgenic monkey model,” said lead geneticist Bing Su of the Kunming Institute of Zoology. “The use of transgenic monkeys to study human genes linked to brain evolution is a very risky road to take,” said University of Colorado geneticist James Sikela, who conducts comparative studies on primates. He is concerned that the research will open the door to more extreme modifications. “It is a classic slippery slope issue and one that we can expect to recur as this type of research is pursued,” added Sikela. This is wrong to do, but is happening anyway. I first warned about monkey-human experimentation just over five years ago (see Russia looking at total GMO food ban; the frightening chimera research). As far as the difference between human and monkey brains goes, it is more than some tissue differences. Frightening, ‘frankenstein-monsters,’ are being worked on in labs. Half human, half pig: What’s the difference? BBC reported about what it called an animal that would be half-human and half-pig. Is such a thing possible? Are chimeras for real? What about a “humanzee”? Are scientists really working on these type of creatures? Is this good? Can something truly be half human and half animal? How are humans different from animals? What is the ‘spirit in man’? What is man? Dr. Thiel addresses these issues and more with biblical-based responses. Here is a link to our video: Half human, half pig: What’s the difference? The Bible teaches that God made everything to reproduce after its own kind (Genesis 1). How much ‘love’ do scientists have for the inter-spliced animal-human entities they are sometimes creating? Do they not brutally experiment and then destroy most of what they are currently creating that way? This is going the wrong direction. We need to turn away from such. This entry was posted on Friday, April 12th, 2019 at 3:00 pm	and is filed under Prophecy.